In their book “Information Feudalism” (2002), Peter Drahos and John Braithwaite argue that the “danger of intellectual property lies in the threat to liberty” (p. 3). Also Jamie Boyle, in his open access book “The Public Domain” (2008, PDF) warns against the potential of strong copyrights to interfere with some of the most basic human rights such as free speech. Only rarely, however, these dangers become so clearly visible as in the current controversy around a Greenpeace campaign video. Inspired by this commercial, Greenpeace created a parody featuring several kids playing other famous Star Wars characters and attacking VW for its CO2 policies on the campaign website www.vwdarkside.com. When today I wanted to see the video embedded at the site, I however only encountered the message delivered by YouTube that the video was not available due to copyright infringement (see screenshot below). For a social movement organization such as Greenpeace, having all its videos blocked on the major online video sharing platform seems to be a big deal – and again questions the three-strikes-rule practiced by YouTube (see also “This Post is Available in Your Country” and “The YouTube Copyright School“). Even more, when taking the transnational dimension of this case into account. The Greenpeace parody may very well be covered by copyright exemptions in several jurisdictions but for reasons of simplicity and to reduce legal risks, YouTube generally blocks videos across the board. In dubio contra libertas. It’s time to end the doublethink: the idea that copyright’s abridgement of liberty (our right to copy) can be fixed such that people are once again free to engage with their own culture, but immortal corporations’ 18th century printing monopoly still provides them with billion dollar revenues. According to the fundamental principles of natural rights, there is only one possible conclusion: abolish copyright. This restoration of mankind’s liberty may well be unthinkable, but then so is the alternative: our cultural repression by a totalitarian police state. Even if we close our minds to these unthinkable options, we are currently heading toward the latter option by default. Talking of Governance Across Borders, Richard O’Dwyer is facing extradition from UK to US for merely linking to sources of illicit copies, and up to 10 years in a pound-me-in-the-arse penitentiary. So, merely by INDUCING others to take back their natural liberties, this chap is facing severe punishment, let alone chronic loss of liberty. As Thomas Paine explained at the time of the passing of the US Constitution, rights are inherently in all the inhabitants, but charters such as the 1709 Statute of Anne and the 1790 US Copyright act, by annulling the right to copy in the majority, left it, by exclusion, in the hands of a few – ‘copyright holders’. Consequently, such privileges are instruments of injustice. I explain a little more fully in The 18th Century Overture – A Crescendo of Copyright – Natural Finale and Reprise. Thank you for your thoughtful comment, specifically for pointing to the case of Richard O’Dwyer. But as I have argued elsewhere (see “Reflections on Abolitionism“), I am still sceptical whether abolitionism is a feasible position, while do acknowledge the important role abolitionist critique plays in opening, broadening and to a certain degree levelling the discursive field of copyright reform debates. When you have ruled out the impossible, whatever remains, however improbable, must be the truth. How can one support both fundamental principles of ethics AND legislation that conflicts with it? Of course some do, via doublethink or corruption, but as an engineer and scientist such mental faculties aren’t useful to me. I’m just providing an explanation as to what’s going on, how natural rights explains why people’s natural liberty will inexorably supersede privilege. It doesn’t matter how powerful the state and its corporate lobbyists are, they are not a match for the masses. Sure, thousands, even millions, will suffer injustice, but eventually the camel’s back will break. 1) Velvet revolution – democratically achieved repeal. 2) Totalitarian* policing – we know how this horse will finish. 3) Commercially superior alternative – my R&D area – © atrophies. I think too VW will suffer a loss of image from having obscured the vision of this video: above all in Germany, but I would say in general in Europe is waking up a very strong sense of civic duty related to the coherence between what someone said and does: in politics, economics and business. I agree in saying that inevitably a substantial revision of the rules of copyright: how can we think in times like these, to be the only creator, the sole author of an idea? As per the video I linked to, it seems Germany is one of the least dangerous at the mo. 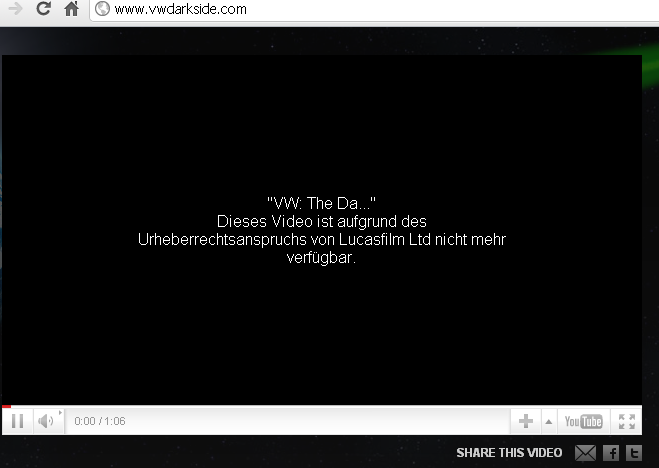 GreenpeaceVideo’s account appears to be working OK now (http://www.youtube.com/user/GreenpeaceVideo) … The Dark Side video is blocked in English but not, apparently, in any other language. Which really does show what a farce the whole thing is. Thanks for the update on the GreenpeaceVideo account and the language differences!